IMPORTANT NOTE ABOUT SUBMITTING: The submission tool will time out after 15 minutes of inactivity based on the oldest inactive tool window and you will lose the submission you were working on. 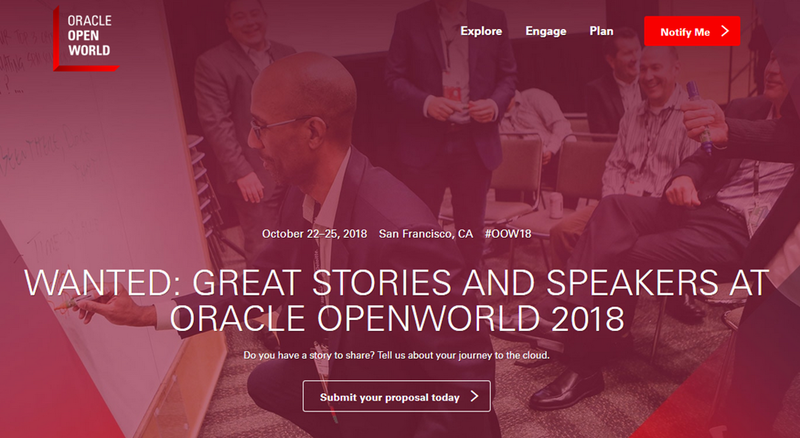 Please review the Speaker Guidelines and Instructions for submission information and key dates (subject to change) for Oracle OpenWorld before starting your proposal. Make sure to take note of your session confirmation number after you enter the session. By submitting a proposal for consideration, you authorize Oracle to promote, publish, display, and disseminate the content submitted to Oracle, including your name and likeness, for use associated with Oracle OpenWorld 2018. Press, analysts, bloggers and social media users may be in attendance at Oracle OpenWorld. RainFocus supports Internet Explorer 11 and Edge, as well as the current versions of Firefox, Chrome and Safari.